A black and white photograph of 200 Colborne Street West. 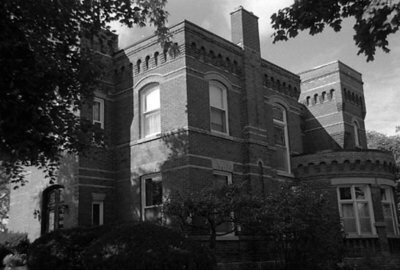 This brick house is located at the north west corner of Colborne and Byron Streets (200 Colborne Street West). It was formerly the home of George Conrad Gross and Corbett H. Stiner. 200 Colborne Street West, October 2005, Carl Ferencz. Whitby Archives A2013_016_003C.